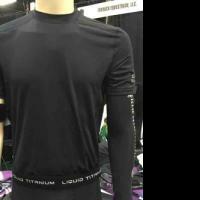 Fenwick Equestrian's Liquid Titanium® Far InfraRed fabric incorporates a patent pending technology which has resulted in the production of a highly functional therapeutic shirt that heals and relaxes muscles naturally. Our Liquid Titanium® products improve blood flow without compression and accelerates the healing process. 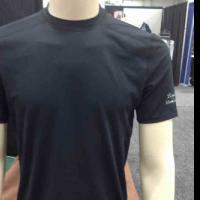 "Our Far InfraRed fabric enables the body's natural ability to heal!" Far Infrared Rays (FIR) is a light energy and is considered essential to our well being and health. According to NASA, infrared stimulation is an ideal way to maintain cardiovascular stimulation. 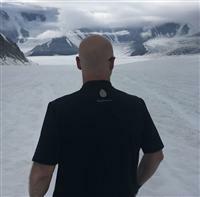 Fenwick's Liquid Titanium fabric produces internal warmth enabled by Far Infrared Rays that are able to penetrate into the skin's subcutaneous layers where they convert into radiant heat, raising the body temperature. Blood circulation is the result, thus beginning the "domino-effect" increasing metabolism and creating an improved immune response. Detoxification is achieved as the warmth from radiant heat helps to flush out toxic substances, heavy metals and other cell waste products through the sweat and fat glands in the skin. 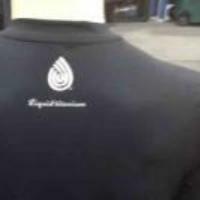 In addition, our Liquid Titanium fabric has eased nervous tension, stress and anxiety producing a calm and balanced mood with increased awareness in many people. Liquid titanium also produces Negative Ions which have been proven to make us feel better by providing us with more energy and a positive mood. Think of when you are at the beach and the air smells so clean, or after a rain shower and everything seems so fresh. This gives you an idea of what negative ions can do for you. Then, think of how you feel being in a centrally heated or air-conditioned office all day, every day. You can't wait to get outdoors and breathe fresh air! Statistics have proven that when an ionic air purifier is used in offices, people's performance increases by 25%. We can only absorb 15% through breathing, but by using the skin to absorb negative ions, we can absorb up to 100%. 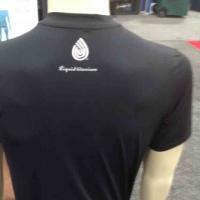 Our cutting edge fabric allows one to continually wash and dry the product without diluting the qualities. 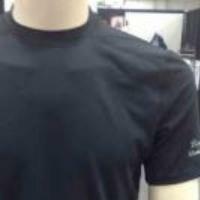 These shirts are great to wear on long trips in automobiles or on airplanes. You will arrive feeling much better and with more energy to enjoy yourself!